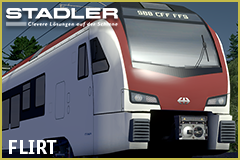 Stadler FLIRT (Fast Light Innovative Regional Train; German: Flinker leichter innovativer Regional-Triebzug) is a diesel or electric multiple unit railcar made by Stadler Rail of Switzerland. The articulated trainset comes in units of two to six cars with two to six motorized axles. The FLIRT train was originally developed for the Swiss Federal Railways and was first delivered in 2004. The trains quickly became a success and were ordered by operators in Algeria, Azerbaijan, Belarus, the Czech Republic, Estonia, Finland, Germany, Hungary, Italy, Latvia, the Netherlands, Norway, Poland, Serbia, Sweden, Switzerland, the United Kingdom, the United States, and, most recently (2018), Canada. As of 18.04.2018, more than 1500 units have been sold. Improved Public Transport 2, to assign Workshop trains on train lines. If you have any request, refer request form located on my Steam profile. There is a downvote fairy in workshop, who is downvoting every vehicle asset that gets released not done by him. If you like this model, make sure to upvote it. Thank you for showing which parts change color in the images! Thank you for this generic version! Looks awesome! WINK is a derivative from FLIRT model (I assume you know that already), from what I gather WINK is supposed to be between GTW and FLIRT, using FLIRT control cars and its own custom power unit between, that gives you a configuration of 3 cars total, not 5. Generic variants are based on Slovenian Railways order and configuration and trains are listed as FLIRT DMU. One car shorter configuration is also sold to TexRail in USA and it's also branded as FLIRT.